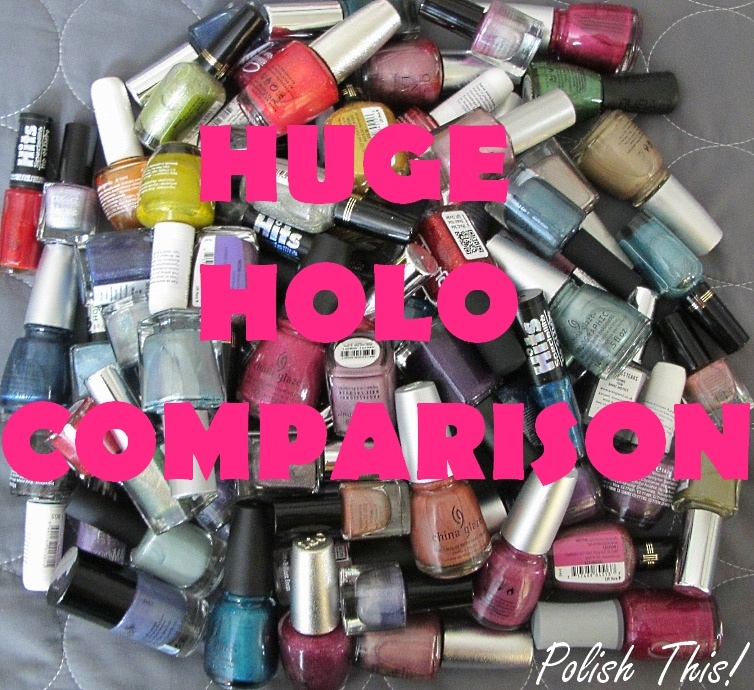 Huge Holo Comparison part 2: Reds, Pinks and Nudes - Polish This! I also wanted to remind you that if the sticks look a bit different, that's because I have three different types of those swatch sticks and one type of them were the bad ones, which melt under the polish. So if some polishes look a bit wrinkly and that's because I had a bad patch of sticks, so just ignore that, it's not the fault of the polishes. But let's start with the red ones! So I have total of six reds here. I have been trying to find the perfect red holographic for me, so that's probably the main reason why I have six polishes that are quite close to each other. 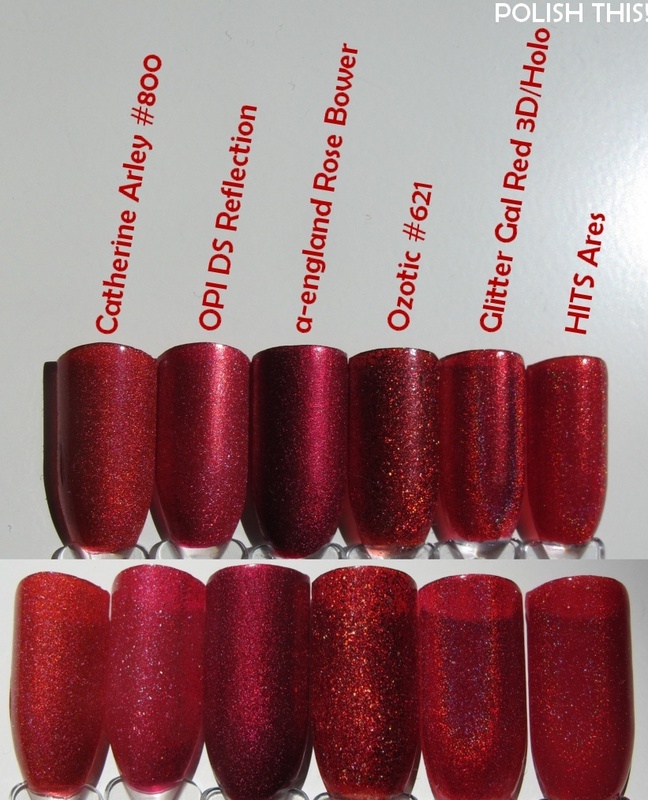 Also, I do love a great red holo... But I have already gotten rid of two of these, the Catherine Arley one and the HITS one. They are both great red holos, but I seriously don't need six red holos, so I had to figure out at least couple that I'd be willing to live without and those were the ones that had the least significance to me. All four that are left are slightly different colorwise too! OPI DS Passion is a gorgeous color and the polish has special meaning to me as it is one of my first OPIs. a-england Rose Bower has amazing formula and it's really great colorwise and qualitywise too. 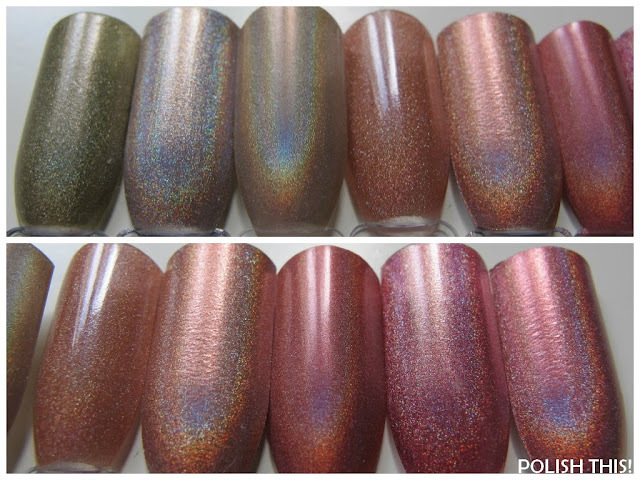 Ozotic #621 is probably the one that is the most gorgeous one to me, I just love those slightly bigger particles in it! Glitter Gal Red 3D/Holo was the other one that I was thinking about getting rid of, but it has the most intense holographic effect in it and it's the most linear one. Maybe I can live with four red holographic polishes..? Ok, so total of 13 pink ones... Well, at least these have more variety colorwise than the red ones. 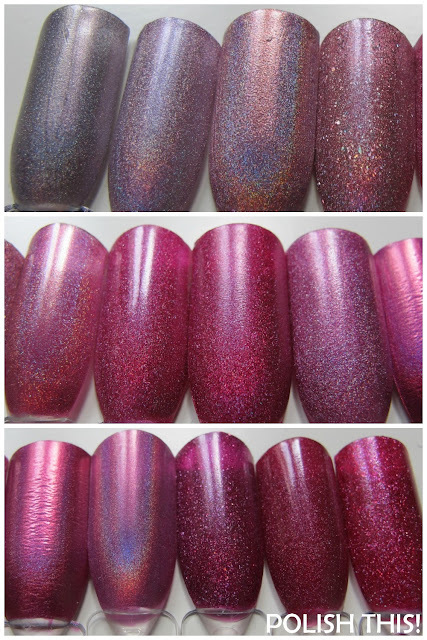 Also there are couple that could be also with the purple ones (like OPI DS Extravagance for example, but I wanted to have it in the same picture with Orly Miss Conduct because they are like sister polishes, so that's why it's here). a-england Princess Tears is quite different from the others as it looks almost grey but it has a hint of pink in it. 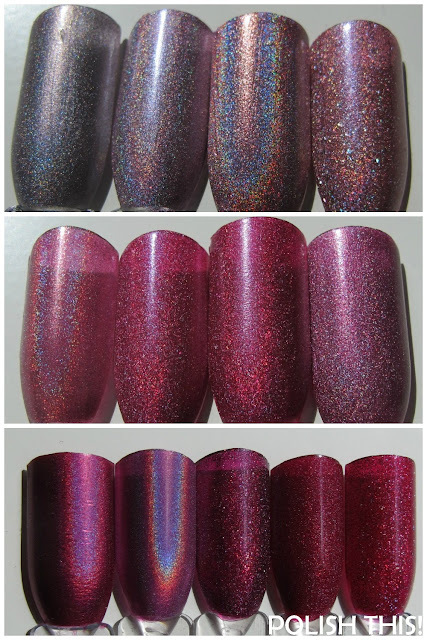 Color Club Fashion Addict and Halo-graphic are quite close to each other colorwise, but their holographic effect is different from each other. Halo-graphic has more linear effect, but I can't really decide which one I would prefer... I really don't need both! Milani Digital is again a bit different as it's quite sheer (suitable for layering). 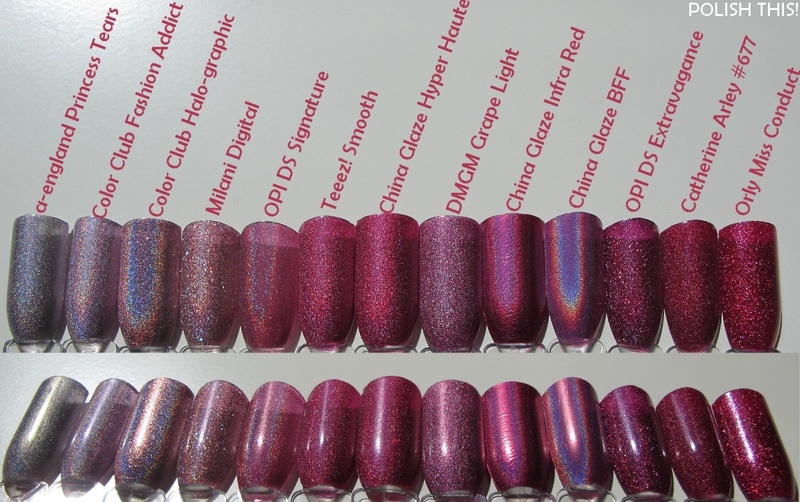 OPI DS Signature is also quite sheer as, but the color and the holo effect is slightly different from the others. Teeez! Smooth and China Glaze Hyper Haute are pretty much the same thing, so I need to figure out which one I'd be willing to give up as I don't need them both. DMGM Grape Light is also colorwise different from the rest. 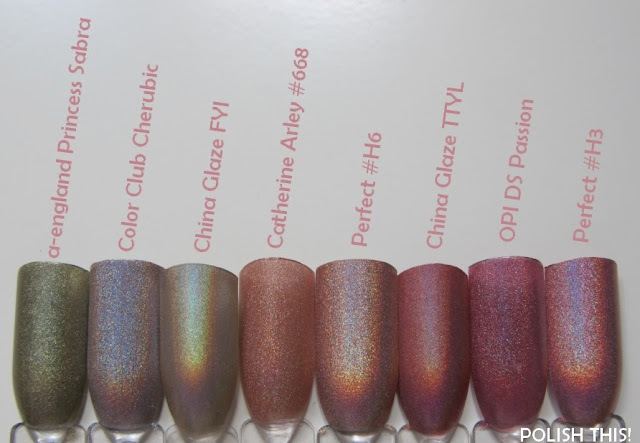 China Glaze Infra Red and BFF have the same kind of base color, but the effect and style of the polishes is different. It's probably no surprise that I prefer BFF, so Infra Red got to go. 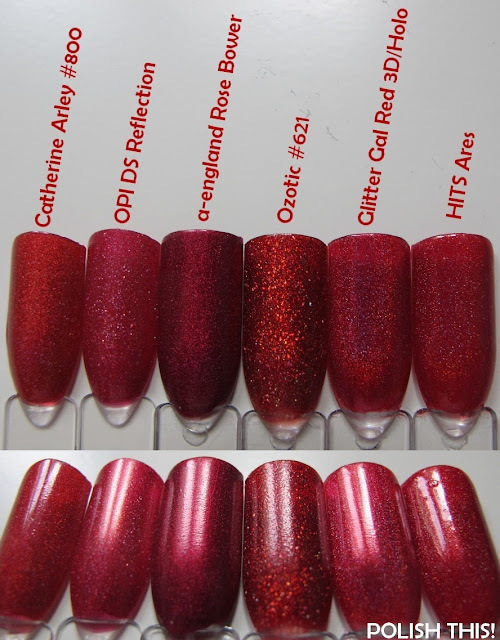 OPI DS Extravagance, Catherine Arley #677 and Orly Miss Conduct have all the same feel to them, but they are slightly different colors. I looooove Extravagance and Miss Conduct, so Catherine Arley was the one that I ditched from these three. a-england Princess Sabra was already included in the green comparison, but it was quite close colorwise to the nudes, so it's here too. Color Club Cherubic and Catherine Arley #668 are really my favourite polishes as I love nudeish holos. I'm not so sure how I feel about China Glaze FYI, the color and the effect don't seem that appealing to me, but again, it's HTF, so I think it will stay in my stash at least for a while. Perfect #H6 and #H3 were quite close to the others colorwise, so they were quite easy to ditch as they don't really have any meaning to me. I do like China Glaze TTYL very much and OPI DS Passion is a gorgeous color too, though it's a bit sheer. So tell me guys, which ones are your favourite ones? Thanks for a great comparision. I love holos, if I could, I'd buy them all! xD But since I can't, I have to thank you for these great comparisons you've been doing, they're really helpful when it comes to picking your favourite shade. I love this :D So many holos!